Leon Koudelak (left) and Woratep Rattana-umpawan. 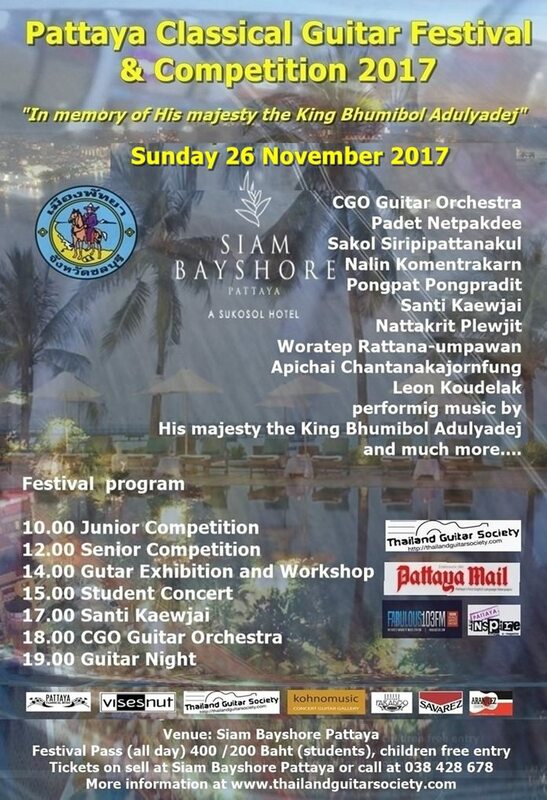 The Pattaya Classical Guitar Festival & Competition 2017 will be held at the Siam Bayshore Pattaya on Sunday 26th November. This year’s ninth edition will be in memory of His Majesty the late King Bhumibol Adujadej and music by His Majesty will be performed along with many others from the guitar repertoire. 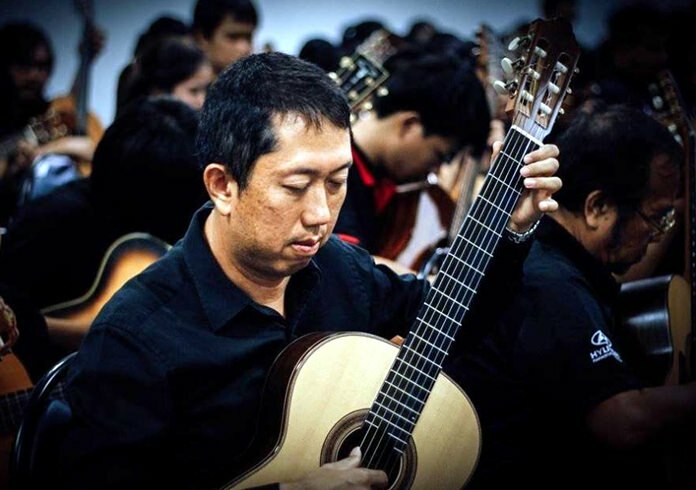 For the first time the festival will include a performance by a guitar orchestra, the CGO (Classical Guitar Orchestra), which was founded last year in Bangkok by Sira Tindu­kasiri and is conducted by Apichai Chantanakajornfung. The festival is the only event of its kind in Thailand, showcasing many of the world’s top guitar makers and musicians, and is open to the public with collectors, players, music lovers, students and general enthusiasts strongly encouraged to attend. 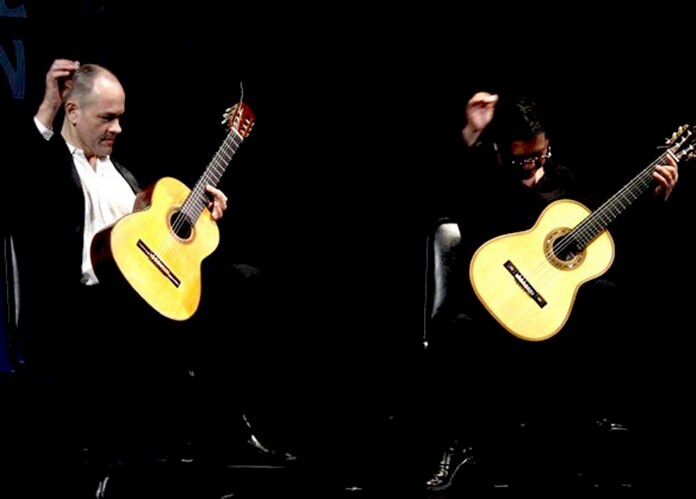 The festival is the biggest and most vibrant event for classical guitar aficionados and music lovers on the Eastern Seaboard. This event will kick off with the adult and junior guitar competitions at 10:00, followed by a guitar exhibition at 14:00 and the student concert at 15:00. Thai virtuoso guitarist Santi Kaewjai and last year’s competition winner Nattakrit Plewjit will both be performing afternoon concerts and will be followed by the CGO (Classical Guitar Orchestra), soloist Padet Netpakdee and finally the “Guitar Night” featuring the expert strumming of Pongpat Pongpradit, Woratep Rattana-umpawan, Sakol Siripipat­tanakul, Nalin Komentrakarn and Leon Koudelak, which will start at 19.00. Admission / festival pass (inclusive of coffee breaks) is 400 baht for adults and 200 baht for students (with valid I.D.) Tickets are on sale at the Siam Bayshore Pattaya, call 038-428-678 for purchasing and to learn more about the event visit www.thailandguitarsociety.com.